Congratulations to Simone on her debut single. Simone was a member of Castlegate Singers and we want to wish her well in her musical career. Below is a quote from her press release. 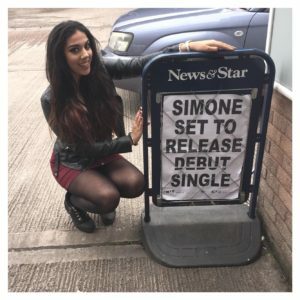 ‘Inevitable’ is the first song that Simone has written, but from a string of local solo show stopping performances at events like ‘Rock the Lakes’ and ‘Reboot Festival’ it is apparent Simone is a seriously talented singer, performer and now songwriter with the potential to shake up Cumbria’s music scene. ‘Inevitable’ has come from the place all the best songs come from, a young musician sitting in their bedroom with a guitar, emotions and no way of leaving until it’s out of their system.